Home / OTHER SPORTS / Uncategorized / Alabama Senate Coverage based on Pure Statistics – A Rain Check on the Democratic Blue Wave? Alabama Senate Coverage based on Pure Statistics – A Rain Check on the Democratic Blue Wave? We beat everyone tonight, that is what happens when you rely on pure statistics, I’ll see everyone for the various special elections to come in 2018! Have a good night, hope you enjoyed the coverage, and have a Merry Christmas and Happy Holidays! Not the AP, ABC, CBS, NBC, FOX, 538, Politico, the New York Times, no one, called this race at 10:20, but it is over, watch, this Jones margin is only increasing. We have called the race, votes pouring in cities, all Jones. Votes keep coming in, and Jones is still running about five points ahead of those benchmarks. The margins in those four counties have shrunk a little bit, but Jones is well on pace for a 1-3 point victory statewide. We are getting near prediction mode, I’d have Jones somewhere between 75 and 85 percent, but it is not over yet. But it is REALLY close, we could be headed for a recount, which is automatically triggered in races closer than half a percent. As more precincts come in, Moore is surely going to close the gap in those four population centers, by how much will decide whether or not Republicans hold the state. Moore’s lead just got cut in half after a lot of the population centers dumped some votes. It is really that simple… I’d have Jones at a 2/3 chance of winning. Looking at these counties, I’ve noticed that both candidates are doing about as well as I expected them too, but what you might not have realized is that turnout in Democratic counties is generally much higher than expected based on the primaries and the last midterm election. Perry County is fully in, and Doug Jones has won by almost 60%, that is about where he should be. I told you guys to watch those benchmarks, and they’ve only gotten better for Jones. He has officially taken a lead in the PredictIt live betting model, keep an eye, it swung 20% in the span of minutes earlier. Jones beating all four benchmarks, but very few votes in 3/4 counties. Limestone county finishes at Moore +19, he won it by 23 when he won the state by four back in 2012… so we’re still at a dead heat. I’d have it at a 50-50 split still, right where I was before polls closed. If you are a betting person, buy Jones at 20 cents to the dollar. More just took the statewide lead, but he is still behind in all four of my benchmark counties, betting markets also snapped back towards Moore violently. More results are in in the Northern county of Limestone (we are choosing this one just because it has the most precincts reporting) and now Moore, who would expect around a 20 point victory their, is up by 24. The PredictIt live betting model has Jones up to 49%, up 16 points in the past hour, I’m telling you, watch those benchmark counties. Limestone County is the only county with more than half of their precincts reporting, and Jones is outrunning Hillary by 15-20 points. 8:42 – Doug Jones might have a shot? 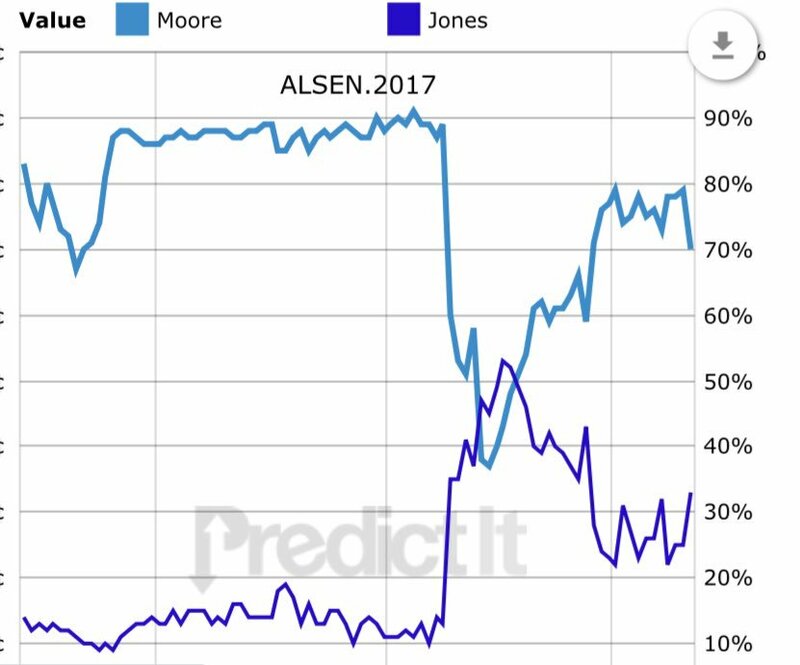 Jones is up 10% in the past hour in the PredictIt live betting model, and while we still are at 2% in, Jones is beating both of his bellwethers I set, and Moore isn’t meeting either of his via the New York Times live results by county. 8:22 – <1% Reporting, don’t get fooled! Here is the poll by CNN, shows a race within a percentage point with some very basic reverse engineering. The 30% Black Electorate is above what would be considered a great night for Jones, but even that wouldn’t be enough to make up a 40+ point loss among white voters. All right, I know that is a lot of information, but let me break it down. First off, the baseline I’ll be using is my demographic + polling model. Normally, I’ve noticed this model is skewed towards Democrats, but in a heightened state of Democratic awareness, it has performed better than my more turnout based models during Georgia-6th and Election Day last month. This model was separated by a few thousandths of a percent between the two candidates. Taking into account recent polling trends, I changed my projections from a toss-up to about a 65% chance for Roy Moore to win. Then, the exit polls came in. The most telling number to me was the 30% black makeup of the electorate, higher than even my tossup model projected. If the exit polls are correct, I would put Jones as a favorite, but if you remember back to the 2016 presidential election, exit polls normally OVER represent black and college-educated voters, and therefore over-represent Democratic candidates. Right now, I’m back to a tossup as we are going towards poll closing. Trump’s favorability is 48-48 among voters, while among the population of the state as a whole, it is a double-digit margin for Trump. Doug Jones’ favorability is above Roy Moore’s favorability in the same poll, and the “shares my values” poll (not pictured) also shows Jones, who is pro-choice, ahead of Moore. I would bet that if Jones was pro-life, he would be miles ahead.